The Suzuki Method was developed in Japan by Shinichi Suzuki after the second World War. Initially, it was a violin pedagogy method, but was soon adapted to a variety of other instruments. The Suzuki Method is now used worldwide to teach piano, cello, viola, flute, guitar, recorder, harp, and other instruments. The Suzuki method is also sometimes called the "Mother Tongue Method". Dr. Suzuki made the famous realization that "all Japanese children speak Japanese". What was remarkable about that to him was that Japanese is considered a difficult language to learn, yet all children in Japan speak Japanese fluently. In fact, all children all over the world speak their native language fluently, regardless of the difficulty of the dialect. Suzuki realized that all children are born with the potential to master the intricacies of language and ultimately do, with very few exceptions. He developed a method of teaching an instrument that closely mirrors language development in very young children. What he discovered is that, contrary to the widely held belief at the time, all children are capable of musical ability with the right environment, not just those with "talent". This doesn't mean that everyone will achieve the same level of competence on their instrument, but that everyone has potential. The right combination of environment and hard work will result in success. 1. Early beginning: Children's brains are at their developmental peak in terms of language up until around the age of seven. Studies show that children moving to a foreign country will have no accent if the move happens before age seven, but typically will carry a slight accent if the move happens after age seven. Of course, there are exceptions. Children should begin listening as early as possible (at birth, even) and students can begin formal training as early as 3-5 years old. This does not mean that after children reach age seven that the window is closed!! It is never too late to begin studying. 2. Immersion: When children learn to speak, they are surrounded by language all day, every day. Speech usually begins slowly; maybe a word here, a word there. Soon, however, sentences begin to emerge, and before long, children are speaking fluently. When learning an instrument, children listen to recordings of the pieces they will study for a very long time before actually attempting to play them. Constant repetition is used to internalize the skills needed to play. They are also encouraged to go to live local concerts. Group lessons create a sense of community with the students. They are constantly hearing, seeing and playing with their peers. 3. Parent involvement: Parents come to all lessons.They also practice with their children, according to the instructions of the teacher. At home, they become teachers themselves. The student then gets lessons every single day, not just once a week. At the same time, powerful bonds are created between parent and child that can last a lifetime. 4. Group lessons: Students learn universal, graded repertoire. Students gather on a regular basis and have group lessons. The class will work on pieces that the children have already played. The teacher will use the review piece to learn a new technique or review an old one. The children learn from and are motivated by the other children in a non-competitive, supportive environment. Each new skill they have learned is maintained and constantly reviewed. Children also learn advanced ensemble skills valuable in an orchestral or chamber music setting. 5. Every child is accepted to study, not just a few. When Dr. Suzuki was developing his method, traditional teaching methods considered anyone who could play well "talented". The pressure in this situation is off the teacher, because those who played badly were considered "untalented", not just poorly taught. Dr. Suzuki felt that every child has the potential to develop talent and it is the responsibility of the parent and the teacher to nurture the seeds of that talent in each and every child. 6. Positive learning environment: Children learn best when encouraged and praised. Children need to know they have all the time in the world to learn what we are teaching them and that we will never force a timetable on them or make them feel rushed. Children learn at their own pace and progress when their own developmental readiness allows. 7. Delayed reading: Children learn to speak first and learn to read only when language becomes second nature. Traditional violin teaching introduces music reading at the same time the student is learning the fundamentals of playing the instrument. This can be overwhelming. More often than not, technique suffers. In the Suzuki method, students learn the basics of playing their instrument first. 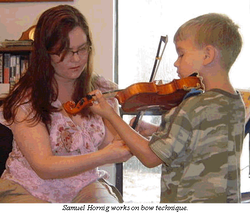 Children learn their pieces by listening daily to recordings. When the teacher beleives they have become technically proficient enough that intense concentration on the new skill of music reading does not interfere with the techniques they have worked so hard perfecting, a reading program will be introduced. 8. Small steps: When learning to speak, children experiment with different sounds before the first word is uttered. Suzuki realized that if the learning steps were small enough, anyone could learn to play. The goal here is to create a "no-fail environment". The smaller the child, the smaller the steps needed. In this way, it may take a very long time from beginning to Twinkle, but each step along the way is celebrated and the child feels proud. 9. Formal teacher training: Teachers who wish to teach the Suzuki Method receive training from teacher trainers approved by the SAA. Teachers are encouraged to share ideas with each other and continue their education on a regular basis. The Suzuki community is close-knit and very supportive. Many teachers collaborate with each other because they share the same philosophy. Also students and teachers can participate in Suzuki Institutes, which are intense workshops usually lasting a few days.